Oro Lift Skin Care Review: Is This A Scam Or Legit? Websites offering Oro Lift Skin Care say it is an advanced blend of active ingredients that help with the mitigation of the skin. The product is for fighting the different aging signs on the skin to make the skin more youthful in appearance. It also softens the skin, improves overall tone and restores its youthful texture. The product also helps fight accelerated aging of the skin in order to dramatically slow down its aging process. It is marketed as a skin lift in a bottle that can deliver anti-aging results fast. No information is stated regarding the price of each container but a free trial is being offered by several websites. After carefully checking different websites offering a free trial of Oro Lift Skin Care, the information regarding its manufacturer cannot be found. It is only stated that the product is proudly made in the USA. Also, it is indicated that 100% satisfaction is guaranteed. The product is very similar to most anti-aging treatments being offered online through a free trial. When you click on the free trial offer on the product’s website, you will be redirected to the website of another anti-aging treatment called Puressance which is also offered with a free trial. One of the major flaws of Oro Lift Skin Care is the lack of detailed information on its formulation especially the active ingredients of the product. It is stated that the product works to relax the skin with regular application. This is said to decrease wrinkles and stop their formation process. It is also said that the formulation softens the skin by hydrating it. This also helps protect the skin from environmental damage. It is also said to use ingredients that improve the elasticity and strength of the skin making it smoother, firmer and softer. Again, there are no specific active ingredients mentioned on the Oro Lift Skin Care website. It is only stated that the product uses advanced anti-aging ingredients that work to repair the skin. Also, the product is said to use special rejuvenation ingredients that help renew skin cells in a natural and effective way. There is no potentially harmful ingredient that can cause adverse effects in the formulation as stated in Orolift.com. The lack of information on what it contains makes it very difficult to believe the claims of the formulation. This also makes it impossible to determine if you are allergic or sensitive to any of the ingredients. Make sure that your skin is clean and dry before you apply Oro Lift Skin Care. Apply a very thin layer all over your face but you also have the option of applying it on your neck. Massage the formula very gently onto your skin to ensure thorough absorption. There is no information available on the ingredients of the product so you need to test it first on a small area of your skin to check sensitivity. If irritation develops on your skin within 20 minutes, this is an indication of sensitivity to any of the ingredients so do not continue to use it. 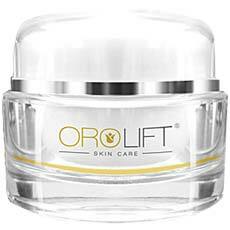 Oro Lift Skin Care is just like many of the anti-aging topical treatments being offered online. The main problem is the lack of details on the active ingredients of the product. It is only worth a try because of the free trial but when you click on the free trial button, you will be redirected to another anti-aging skin treatment.